Our flagship overdrive. Transparent, low/medium gain that never gets in the way or compromises your guitar and amp’s original tone. Includes the Red Remote Function! Categories: JHS Pedals, Pedals & Accessories. Over the years the Morning Glory is undoubtedly our most known and praised overdrive pedal. 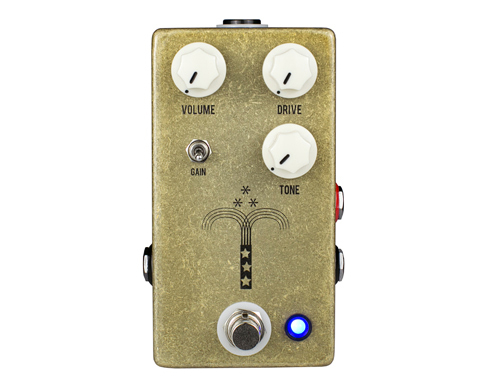 It has won more awards and received more accolades than any other JHS pedal. It was created in 2009 out of a need for an overdrive pedal that simply took a guitar and amplifier’s tone to the next level without adding strong mid frequencies or any other characteristic that came along with the Tubescreamer style circuits on the market. Its goal was, and still is, to be incredibly easy to use and to be the most transparent overdrive out there. Even though the “transparent” buzzword is a bit overused all these years later, the meaning and application still stands as the best way to describe the magic that the Morning Glory brings to your rig. Let’s take a look at what improvements the Morning Glory V4 has to offer. Looking at the controls, we have Volume, Drive, Tone and Gain. The Volume control acts as a master output level control. One improvement of the V4 is that we have added 2x the available headroom to this control if compared to the V3. The Drive control dials in overdrive as you turn clockwise. As this control increases, the treble content is also slightly increased. The Tone control is a basic high-pass filter, and as you turn clockwise, the tone becomes brighter. As you turn this control to the left, it becomes darker. The Gain toggle activates a new boost mode. This mode is overall more powerful, has more low-end content, and when the drive knob is in its upper region, it creates a more high gain tone than ever available in any variation of the Morning Glory. This toggle is indicated by the status LED turning Red and can be remotely activated by way of the “Remote Gain” 1/4″ jack located on the upper right side of the pedal. This ability enables the Gain toggle be used in an on-the-fly application for live performance. Set your normal MG tone and instantly switch the Red Remote for a secondary tone with using hardly any space on your board at all. The Bright Cut toggle is now located on the side of the pedal, still easily accessible but out of the way. This switch is great for rigs that lean a little on the bright side or when you are using the MG as a higher gain drive sound. The input jack is located on the lower right side and the output jack is on the left side. The MG runs on standard 9V DC supply only. Whether you play a Stratocaster or a Les Paul, you will instantly recognize how the Morning Glory is touch sensitive and keeps 100% of your instrument’s feel in place. From “Little Wing-ish” chime to full chord rock & roll, the Morning Glory is hard to beat. If you are one of the thousands who have made the Morning Glory a part of your rig or a first-time interest, the Morning Glory V4 offers all the right features, tones, and ease of use that you are looking for in a primary overdrive pedal. This pedal requires standard 9V DC Negative power, consumes less than 100mA, and measures 2.2″x4.3″x1.5″.